Haley’s actions and attitudes in the UN begin to seem more and more like efforts to undermine the organization rather than reform it. She also said that she would show the world that “when we say something, we’re going to follow through and do that.” And UN reform? She dipped into folksiness, saying, “I love to fix things, and I see a UN that can absolutely be fixed.” She vowed, however, to stay true to her principles, occasionally tempering or breaking with pronouncements by Trump, whom she had freely criticized during the 2016 presidential campaign. On September 19, Donald Trump is due to make his first speech to the UN General Assembly as president of the United States. It appears that he and Haley are now a seamless team of modern-day America-firsters, haranguing allies and enemies alike. At the UN, this kind of American policy is neither popular nor always productive. Haley’s actions and attitudes in the UN begin to seem more and more like efforts to undermine the organization and its credibility rather than reform it. A little-noticed factor in the Trump-Haley relationship may be her ability at the UN to conduct diplomatic negotiations, which may be turn out to be her greatest strength in the job. 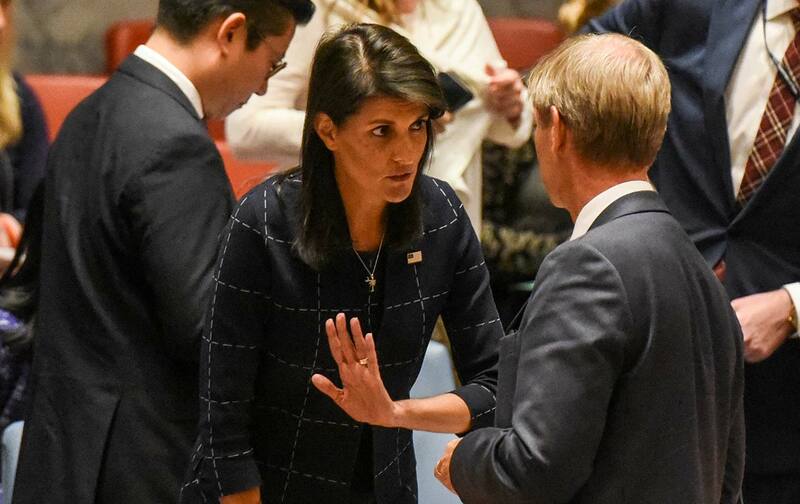 The Security Council discussions over the last week on increasing sanctions on North Korea, after a powerful nuclear-weapons test and continuing missile launches, demonstrated how well she, as a former state governor, understands “the art of the deal,” with all the give and take involved. The United States came into the debate with a much stronger proposed resolution than the one that was ultimately adopted on September 11, after China succeeded in getting it watered down because of its own concerns about the potential reactions of Kim Jong-un. But that made it possible for both China and Russia to join the consensus, and Haley got a unanimous 15-0 “yes” vote against North Korea, an outcome that sent a message of unity to Kim. Stephen Schlesinger, a leading historian and analyst of the UN from its creation, differentiates Haley’s approach to negotiating from her underlying attitudes toward the UN. By late June, five months after her Senate confirmation testimony, Haley appeared again before the Senate Foreign Relations Committee for two days of much sharper questioning, and it was clear then that she had fallen in line with the Trump White House. “I don’t go rogue on the president,” she told senators. She spoke as an unquestioning defender of what Democrats in particular were calling an “incoherent” American foreign policy run on tweets, outbursts, and flip-flops. Haley’s work at the UN increasingly looks like her strategy for moving into higher political office or other government roles—as secretary of state, perhaps, if Rex Tillerson’s apparent growing dissent with the White House leads to his resignation or dismissal. The UN is becoming her platform. Like Trump, she is playing to the conservative base, where fans of the UN are few and far between. At the UN, Haley threw herself into budget slashing, mostly to save money that could be diverted into US defense spending, as she freely admitted in her Senate testimony. The same motivation applied to her support of the Trump budget proposals that called for an end to US funding for UN agencies that had long enjoyed American support, among them UNICEF and the World Food Program, a move that provoked disbelief and outrage among senators of both parties during questioning in June. Haley had no problem with the total cut-off of financial support for the UN Population Fund, UNFPA, which was one of Trump’s first executive orders. She joined Republican conservatives in declaring herself “pro-life” and bought into the fiction that the Population Fund, the world’s largest provider of family-planning and maternal-health care, was actively supporting abortion in China. She told senators that Trump’s decision to withdraw from the Paris agreement on climate change “was in the best interest of business and the best interest of our country.” Trained as an accountant, she appeared to judge UN programs by two yardsticks: cost-effectiveness and relevance to American national security. In recent months, Haley as taken several quick trips to visit UN outposts to question the value of important areas of the UN’s work. In June, she made a bizarre cameo appearance of about three minutes at the UN Human Rights Council in Geneva just to announce that it was a flawed body that had to change. Later that day, she laid out before a bemused audience of international-affairs experts at the Graduate Institute of Geneva a list of demands that she said the council had to meet or the United States would “go outside” to promote human rights. The threat of a US withdrawal hangs over the council, with no further action or hint of a decision coming from Washington. The demands she made in Geneva are largely impossible to meet, at least in the near term. Haley called for a complete revamping of the elections process for members of the council and the deletion of a provision that allows for singling out Israel for criticism. Haley has taken credit, a good part of it deserved, for engineering a $500 million cut in the peacekeeping budget. In her congressional appearances, however, she was challenged by senators about how this could be justified at a time when the UN was fielding a record number of peacekeeping missions in a tumultuous world. After her Geneva visit, Haley moved on to Israel to talk with Israeli and Palestinian leaders about the UN’s work in the region. A stalwart supporter of Israeli policies, Haley had questioned the value of the UN Relief and Works Agency for Palestine Refugees in the Near East, which Prime Minister Benjamin Netanyahu asked her to disband after the UN agency found a Hamas tunnel running under two of its schools in Gaza. The United States has been a leading supporter of the agency, created by the UN General Assembly in 1949 to assist Palestine refugees in Jordan, Lebanon, Syria, the Gaza Strip, and the West Bank, including East Jerusalem. Turning to Lebanon, where she did not go on her Middle Eastern trip, Haley worked in the UN Security Council to strengthen the United Nations Interim Force in Lebanon (UNIFIL), where she charged that the militant organization Hezbollah, backed by Iran, has been amassing weapons and fighters on the border near Israel. UNIFIL was tasked with keeping weapons not under Lebanese government control out of that sensitive region. “It is a difficult task, but for too long, the peacekeeping force has been utterly failing to achieve this fundamental part of its mandate,” Haley said in a statement on September 5, after the council extended the force mandate. In its official statement UNIFIL, made no mention of upgrading or strengthening its 10,500-member force drawn from 41 countries. Hezbollah is seen by Washington and others as an arm of Iranian policy and an agent of interference and destabilization across the Middle East. For the Trump administration, influenced by both Israel and Saudi Arabia, two countries visited by the president on his first trip to the region since he took office, Iran has become a major issue. It is also in the spotlight because of Trump’s threat to deny certification in October of Iran’s compliance with the nuclear agreement it signed in 2015 with the United States, Britain, France, Germany, Russia and China. The Trump administration leaves open the possibility of withdrawing from the deal. On a quick visit to the International Atomic Energy Agency in Vienna on August 23, Haley pressed Director General Yukiya Amano and the agency’s inspectors to be tougher on the Iranians and force access to missile sites and military installations. Haley said American allies were just as concerned as the United States, though all the countries that signed the Iran nuclear deal have said they will stick to it even if Washington pulls out. She came back to New York critical of how the IAEA seemed to be doing its job. She was not worried about breaking with other countries that are party to the deal. That was not what the United States saw as a founding principle of the United Nations in 1945.